Debo Band is a 11-member group led by Ethiopian-American saxophonist Danny Mekonnen and fronted by charismatic vocalist Bruck Tesfaye. Since their inception in 2006, the band have toured Ethiopia twice, having appeared at both the Ethiopian Music Festival in Addis Ababa and Sauti Za Busara in Zanzibar, the largest music festival in East Africa. 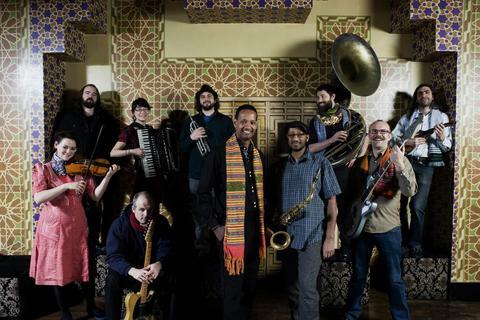 In North America, they’ve shared stages with Gogol Bordello, The Family Stone, Tilahun Gessesse (one of the great voices of Ethiopian pop since the 60’s), The Ex with Ethiopian sax legend Getatchew Mekuria, Group Doueh, and Khaira Arby and Her Band. They’ve also performed at Lincoln Center Out-of-Doors, The Kennedy Center, Montreal Jazz Fest, globalFEST 2012 at Webster Hall, Joe’s Pub, and World Music Festival: Chicago. Debo Band's debut album will be released on July 10 by Next Ambiance / Sub Pop. The band has won raves for their groundbreaking take on Ethiopian pop music (think Ethiopiques), which incorporates traditional scales and vocal styles, alongside American soul and funk rhythms, and instrumentation reminiscent of Eastern European brass bands — accordion, violins, horns and drums. The album was produced by Thomas “Tommy T” Gobena of Gogol Bordello, recorded at Machines with Magnets (Battles, Deer Tick) and mastered by Grammy nominated engineer Joe LaPorta at The Lodge.